Wow. I posted about the new Makerbot Industries Replicator 2 yesterday. I’m still, site unseen except for the videos, impressed by the design and taking things to a prosumer level but Bre and MI have apparently confirmed that the software and (it seems?) the hardware are both closed source, at least according to Josef Prusa, and people are having an Internet style freakout. Since the first Makerbot machine, the Cupcake, and all subsequent ones, were iterations off of designs from the RepRap community. 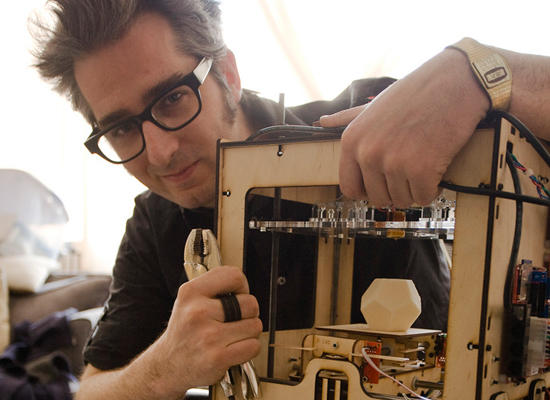 RepRap is pretty much the epitomy of an open source community in both hardware and software. Earlier versions of the Makerbot software, ReplicatorG, just wrapped up existing open source RepRap software components. There has always been some tension between Makerbot Industries as a company selling itself and its ideas to the public (and investors) and the open source roots of their work but they have handled it fairly well until now. Bre and others there have been involved publicly in various open hardware events. MI released their designs for printers to the community, making them available in repositories and on Thingiverse, their site for hosting designs. This has led to quit a few knockoffs and a few outright clones, such as the Tangibot that had a failed kickstarter and was simply a direct, Chinese manufactured, clone of the existing MI Replicator. People have wondered if MI was going to continue to be an open source company in the face of threats like Tangibot, especially with having taken VC money in the last year. Because of this history and the reactions of many open source folks to commercialization of FOSS work, people often seem to have an ambivalent relationship to Makerbot Industries. I’ve been one of them, having felt burned by the way they abandoned support of existing product lines almost immediately on shipping new versions, which is not what you expect from a commercial company with customers. At my hackerspace, this has made us unwilling to rely on MI for our printers, causing us to look at and use various alternatives (and to not replace our aging Cupcakes with newer MI designs). Today, the shitstorm has landed (more of a shitnami as I write this). Josef Prusa, of “Prusa Mendel” fame, claims that he’s called MI and exchanged email with Bre Pettis and that it is confirmed that the new Replicator 2 and Makerware, their new software, are closed source. I’m not sure if this understanding is actually true or if it is that the software is closed source (it has a spiffy giant EULA) with open source components and the Replicator 2 reference designs will be open sourced once they’ve actually shipping in a month or two. The latter is what they did with previous designs, not making them available until after they ship. Regardless of the final picture on this, the RepRep and 3D printing community is freaking out today. The comment thread on Josef’s post is pretty epic (and his “Occupy Thingiverse” post on Thingiverse.com) and now there are a series of Google+ proclamations and responses (see 1, 2, and 3) as people start freaking out about the not-very-recently-changed Thingiverse EULA since Thingiverse is operated by MI. Josef’s post and the controversy have also made Slashdot and Reddit today with people making various proposals for moving the hosting of designs off of Thingiverse. This ought to get interesting but I do hope people calm down. Even if MI and Bre have decided to go closed source, it doesn’t necessarily really affect the RepRap (or larger 3D printing community), given that 3D printing has been dominated by fairly large, closed source, corporate entities for decades. People can continue to iterate on designs and improve things. Personally, as much as I wish that it was open source, having an affordable (under $3,000) 3D printer that is reliable and usable by non-geeks will raise the bar for the larger community. It gives people a target to beat and to do so with open source. I do think people are up to the challenge and I look forward to seeing their work. Update: Bre has posted an official reponse to the kerfuffle.